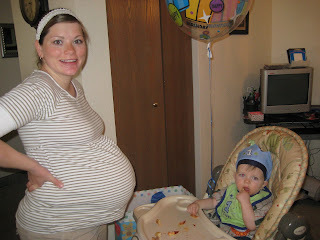 It's crazy to think that today is Connor's actual due date. It seems like he's been a part of our family for a while already. He has been with us for 2 weeks and 3 days! Crazy! Monday I was finally able to give Connor his first bath! Because he came 2 weeks and 3 days early I hadn't gotten the chance to buy him a bath yet. But, a lot of people give this baby's baths in the sink right? This is Connor when I first put him in the water. 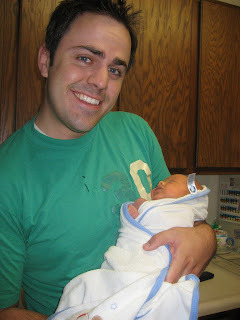 Daddy warming Connor after his bath. Mommy putting lotion on Connor and getting him dressed for bed. All bundled up ready to go to bed. Happy Father's Day to the love of my life!!! Boy does Cade love his Daddy!!! He looks forward to Cameron coming home from work everyday. If he doesn't pick him up as soon as he walks in the door Cade gets very upset! He expects his daddy to take him to our bedroom and wrestle around with him on our bed. He looooves his daddy. I'm sure Connor will feel the same way as he gets older. I feel really bad because the past couple of years Cameron has not had a very great Father's Day due to me having a baby right before. This year ended up being a lot better than last year because I had a week after having Connor, with Cade I only had a few days to prepare. Next year will be a lot better Cameron, I promise (that is if you don't get me pregnant again :). I did get to make Cameron breakfast in bed this year. 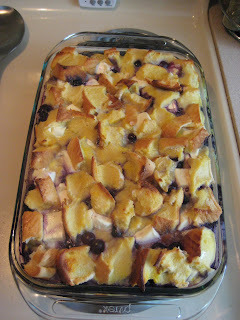 This is a recipe I found off of a cooking blog, Blueberry french toast. It was pretty good, you just can't eat too much of it b/c it's so sweet. It's filled with blueberries and cream cheese. The boys also gave him gifts :) and a card. We then spent the evening with Cameron's family. It was a good day, at least I thought. Happy Father's Day Cameron. 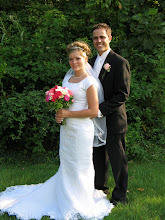 Thank you for being such a wonderful husband, friend, and most importantly (on this day) Daddy!!! We love you! 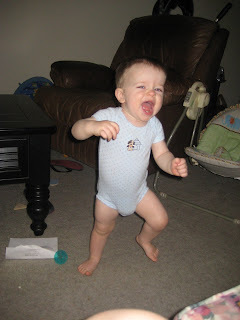 Cade started walking a week before his 1st birthday. (I have a video of him walking that I'm going to add later) He is getting better and better each day. He first started out walking like Frankenstein, you know, arms up in the air and really stiff, it was adorable. He then started lifting his knees up really high, now he's starting to walk more normal. Which, is still cute, but I loved the arms up in the air! He's growing up so fast! Here he is a week ago, he was very proud of himself. 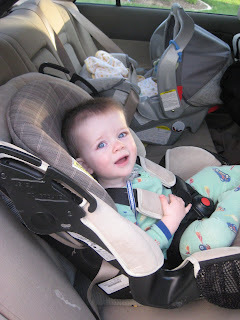 Cade is now able to sit facing the front in a regular car seat. My sister in law, Stacie, gave us this one, thanks!!! 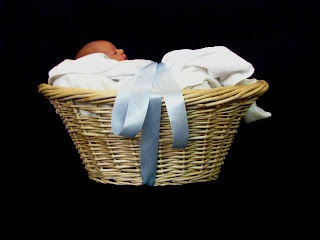 I was in the hospital the first day he rode in his new car seat, but Cameron said Cade didn't act like he noticed a difference. He was always good in his carrier before. This is the first time I got to see him in his new seat. He mainly stared out of the window the whole time. 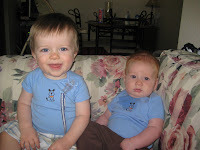 Oh, this is also the first time I rode with both boys in the car! 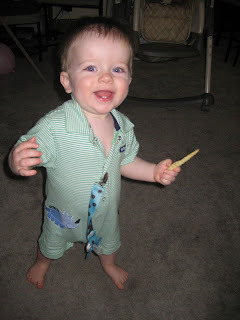 Yesterday I dropped a frozen french fry on the ground and I thought it'd be funny to give to Cade and see what he does with it (I know I'm a horrible mom, giving my kid food from off the ground). This was his reaction. Cade is growing up so fast! 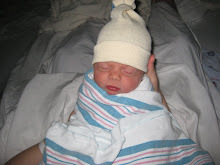 Connor arrived in our lives Wednesday, June 10, 2009 at 10:19 a.m. He weighed in at 7 lbs 3 oz and 19.5 in. Welcome to our family Connor! I woke up around 3:25 a.m. or so(after Cade's big birthday party) and thought I really needed to go to the bathroom. I tried to put it off because I was so tired and finally I gave in and got up. As soon as I stood up my water broke! I didn't realize my water had broken because it wasn't like on tv where all of a sudden you're standing in a huge puddle, I actually just thought I peed my pants (sorry if I just made you feel uncomfortable). Anyways, after needing to go to the bathroom every few minutes I realized this wasn't normal. So, I called my mom around 4:00 and she convinced me my water had broken and told us to go to the hospital. So, we decided we should get up and get ready. 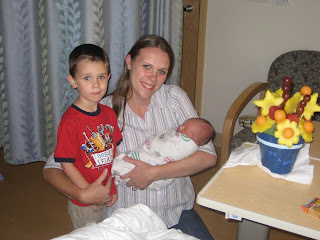 I hadn't packed to go to the hospital because I was actually planning on doing that the day after Cade's birthday. I wasn't ready at all for the baby to come because I thought I still had 2 weeks and 3 days left before he came. This is me before we went to the hospital. You can see our bags we had to pack in the background. How many men do you know that can pack their child's bag all on their own? Cameron packed Cade's bags all by himself, he remembered everything! I was too busy packing my own bags to even think about Cade's, so thanks Cam! 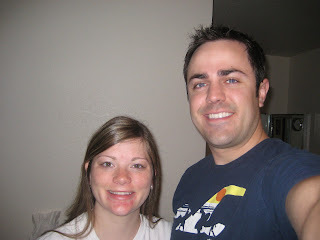 This is us right before we left for the hospital, around 5:20 a.m. 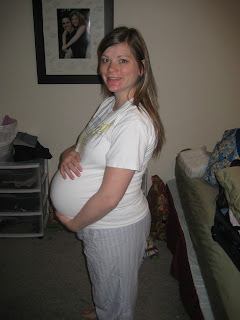 I wasn't having major contractions so we weren't in a huge hurry to leave. 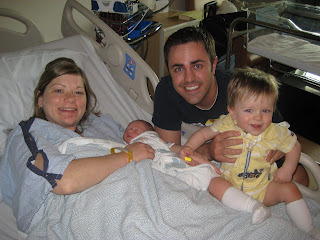 We arrived at the hospital around 5:30. It ended up being that my water had broken and I was dilated to a 3 3/4 when we arrived. Cameron took Cade to his parents after we were all checked in, they watched Cade for us all Wednesday and that night, thanks so much Nancy and Steve. 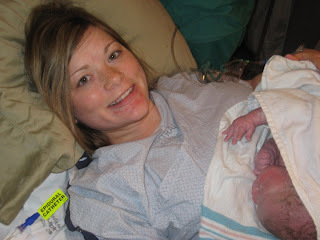 When he got back they gave me an epidural around 7:30 and it was all smooth sailing from then on out. They checked me a little while later and I was at a 4+. Cameron and I watched some tv while we waited, expecting it to be a while until our little guy arrived. We even watched The Price is Right and had a competition to see who guessed the closest prices. Just after 10:00 the nurse came in and checked me again and out of no where I was fully dilated!!! She said he was going to come any minute. She had the doctor come down and they got ready. Finally he had me push during a contraction and he said the head had come out!! I was amazed, that was one contraction! Then he said his body would probably come out completely during my next contraction....and it did!!! 3 minutes after starting to push he was out! 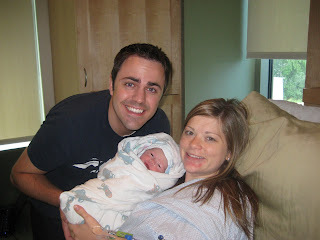 Our 2nd little guy arrived at 10:19 a.m. 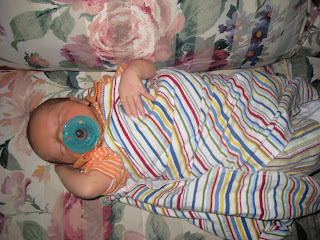 He weighed 7 lbs 3 oz, 19.5 in (2 oz heavier than Cade and 1/2 in shorter). 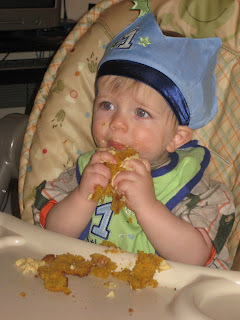 Oh, just in case you haven't caught on, he was born the day after Cade's 1st birthday. 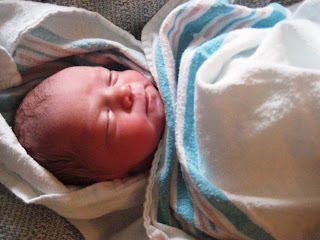 After his first sponge bath, so cute! 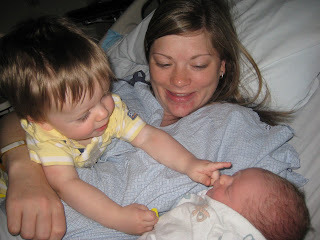 Cade meeting his little brother for the first time. Cade didn't notice him at first, he was too busy climbing all over me. Finally I got his attention and he said, "Ohh, wuzza?" (Oh, what's that?) And then laughed and poked at him. Our first family picture with all four of us. We had many visitors. 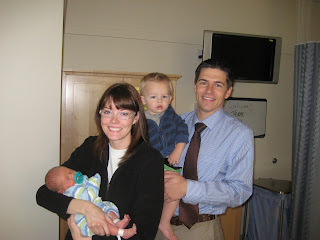 Cameron's parents were actually our first visitors, they brought Cade by to see us too. I didn't get a picture of them at the hospital though, ugh. Cameron's brother, Dave and his family, Lisa, Ellie were our next visitors. They even brought me a Jamba Juice, just what I needed, thanks :) They also watched Cade for us Thursday night and Friday, thank you so much, yall are wonderful! We actually had a couple of people come and visit from our ward. My visiting teaching companion, JoAnn, and her husband were one of the 1st to come by. 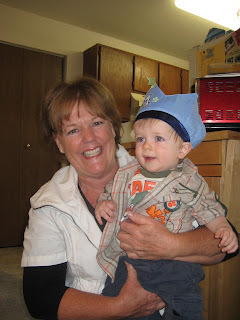 This is our wonderful upstairs neighbor, Gennaveeve, and her son, Ansley. She is also my president in the primary presidency (I'm her 2nd counselor). She came to visit and also made that yummy fruit bouquet, it was seriously really good! Thanks! 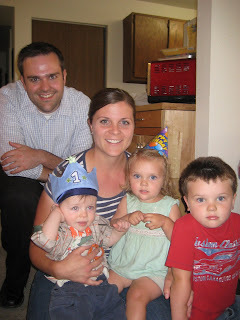 Our good friends, Merideth, Landon and their son Owen came to visit. Thanks yall, it's so nice to have friends near by. 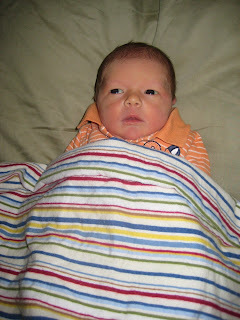 Cameron and I thought we still had at least a week to come up with a name for our little guy. So, we arrived at the hospital without a name for our baby. We couldn't agree on any names. We had names we each liked on our own, but didn't agree on any. 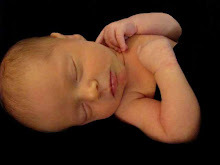 My mom and sister Leah called me every few minutes, it seemed, after giving birth to see if we had come up with a name. During one of the many calls I received from my mom on Thursday we finally came up with an option. She had found a website online and named off several names from it. One name was Connor. I thought, "hmm...I actually kind of like that." So I mentioned the name to Cameron, and for the first time he didn't say no. But, he still needed to think about it. We finally decided on Gavin but only for a few minutes, he said he had buyers remorse and changed his name. Gavin was actually one of my favorite names and he said we could name him that if he could be in charge of the next boy's name, he actually did not like the name Gavin at all. 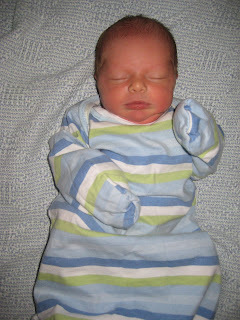 So, we were back to having a nameless baby...naming boys is sooo hard! Finally he decided we would name him Connor, I made him fill out the birth certificate form and turn it in before we announced it to anyone. It was then final!!! Connor Allen Long. Allen is my dad's and grandpa's middle name. Connor getting ready to go to his new home Friday. 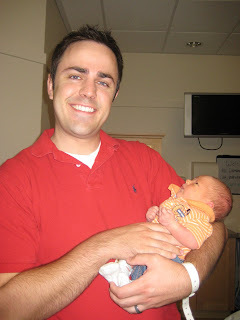 Cameron with his 2nd baby boy. 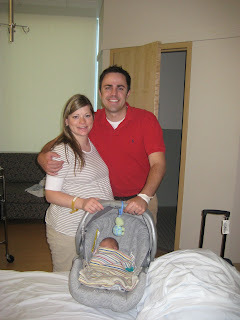 Us getting ready to go home with Connor for the 1st time! AHHH, we're officially parents of 2. I love this picture of Connor. This was soon after we got home, Connor relaxing on the couch. 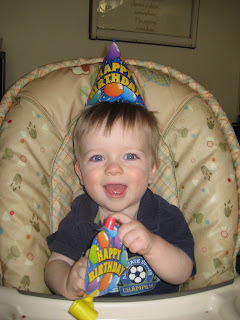 Cade's birthday was last week, Wednesday, June 9th. I can't believe he just turned 1 year old! Happy birthday my baby boy, I sure love you. Cade has been such a joy to have in our lives, he's constantly smiling and on the go, he has the funniest little personality. 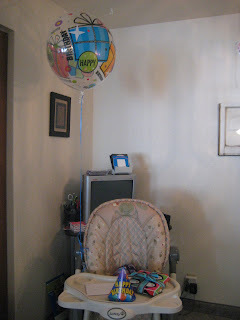 I had put off getting everything needed for Cade's birthday party til after I was done watching Carter. Monday and Tuesday after I finished watching him were busy days, running to and from different stores, decorating and making his yummy birthday carrot cake cupcakes. I was totally worn out! But anyways....his birthday party turned out great! Cade had a blast with everyone so, thanks to everyone that came! This picture actually wasn't taken on Cade's birthday, I took it so I could have a birthday picture to show at his birthday party. I thought it was adorable! 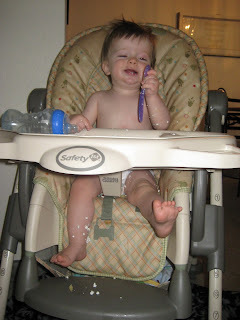 Cade's birthday breakfast of cottage cheese and fruit. 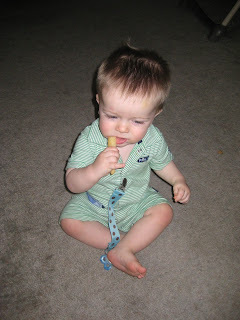 He loved eating it all by himself, this was the 1st time he tried a spoon (it ended up on the floor). 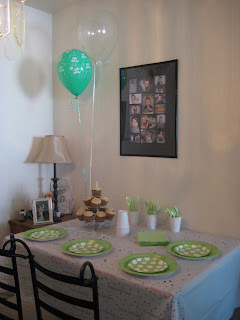 The birthday decorations. I decided to go with green and white instead of a theme. Above the table is a collage of Cade's monthly pictures I put together. I had the hardest time trying to decide on what kind of cake to make and how to decorate it. 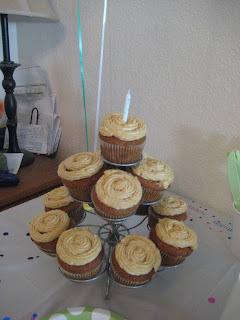 Finally I decided to make these carrot cake cupcakes I found on a cooking blog I follow. I guess she got the recipe from Martha Stewart. They turned out great! The icing had orange zest in it so that was something a little different than a regular carrot cake. I decorated the coffee table for the kids and some other guests to sit at. Each child received a goody bag and a party hat. 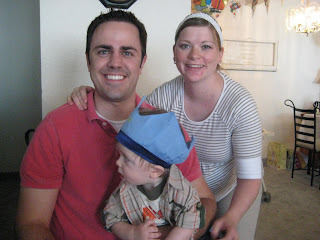 Me and my 2 boys on Cade's 1st birthday! Cade was really enjoying his 1st ever pizza, he loved it! 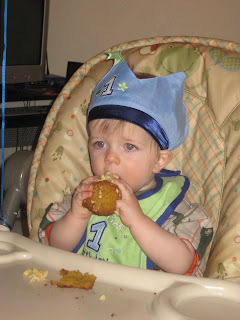 He didn't hesitate one bit, he knew just what do do to that cupcake. 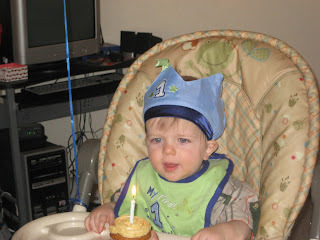 He looooved his first ever cake! Us with our BIG BOY! Dave, Lisa, Cade and his cousins, Ellie and Mason. 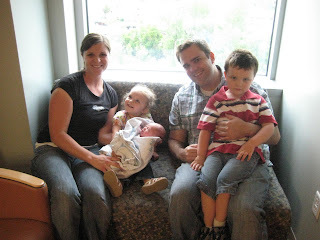 Our good friends, Landon, Merideth and their son Owen with Cade. 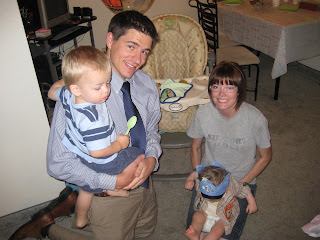 A couple of weeks ago Cameron's sister, Stacie, and her family came to Utah to visit the family. We had a great time visiting with them! I didn't actually take a lot of pictures, but here are a couple that I did take. 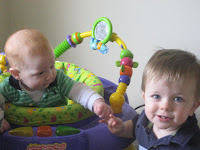 I mainly only took pictures of Cade with his cousin Lexie, they were adorable together. She's only a few months older than Cade. 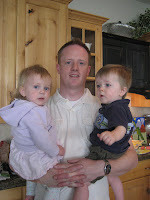 Left: Stacie with Cade and Lexie. 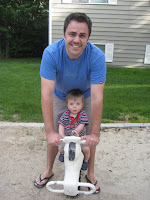 That Saturday evening we decided to take Cade to one of our apartment complexes playground. 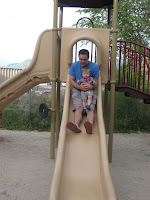 I took him to the playground a few months ago, but he was a little young to know what was going on. 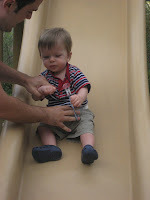 Now he's older and he was a little scared of the slide, but had a great time with Daddy! 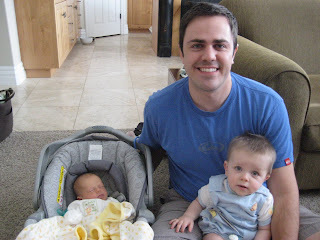 Our friends, Brad and Laura, asked us to watch their kid, Carter for them for 4 weeks (May 11-June 5). 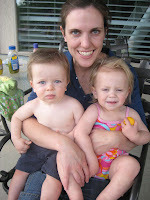 Laura had to go back and finish out the rest of her teaching year after having maternity leave for a few weeks. I gladly accepted the offer of watching Carter for them thinking it would be great practice for me to have 2 kids around and for Cade to have another baby around. 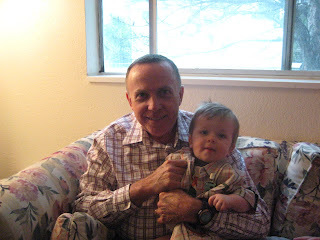 It went great, we had a lot of fun w/ Carter being around, he was a wonderful baby. Cade loved him! I am so behind on my blog. 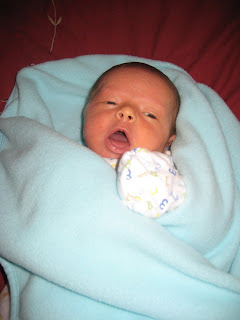 I have been meaning to add a lot lately but, I have not really gotten on the computer since having Connor, our 2nd baby. Cameron's laptop cord broke and we just got a new one today. I could have gotten on our desktop computer, but the chair is way to uncomfortable to sit in for so long, due to my sore tail bone and other soreness from having a baby. So, I decided to wait. The next few posts are all catching up, so enjoy! My baby is turning 1 year old in a week!!! AHH! I can't believe that it's already been a whole year since I gave birth to him. He has been such a joy to have in our lives. 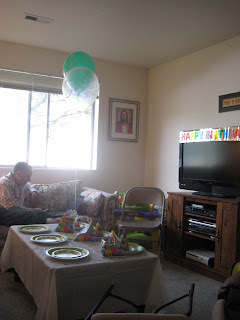 I'm actually going to be throwing him a little birthday party next week, I hope it goes well. These types of things is when I wish Bonny and my mom were around to help out :( But, anyways, my baby is going to be ONE!